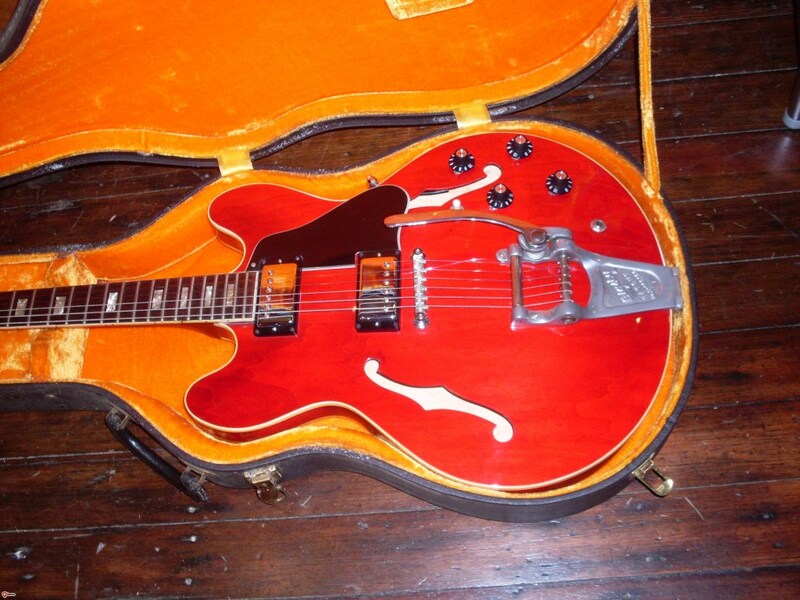 This ES-335 59 reissue is listed on Ebay for around $6500. It looks a lot like a real 59 (except the pickup covers are still wrong). That’s a lot for a new guitar. I’m sure a fair number of man hours goes into them but still, I imagine Gibson is making a few bucks on these. I don’t pay enough attention to new Gibson 335’s. I get a lot of questions about them and I see a few but I must be out of the loop a little bit. I just got a catalog from one of the very large musical instrument sellers and was sticker shocked by the current price levels of the top of the 335 line-the 59 dot neck reissue from Memphis. This particular seller wants $6199 (and up!). Is it me or does that seem like a lot for a new 335? Granted, a real 59 will cost you at least $18000 and up to over $40,000 but here’s the rub…like a new car, the moment you take your brand spankin’ new 59 dot reissue out of the showroom, the value will drop by at least 30%. So, make sure you really like it before you walk out the door with it. With a vintage guitar, assuming you buy it from a reputable seller who is giving you exactly what you are paying for, it’s going to be worth at least what you paid for it for more than the 3 minutes it takes you to walk out the front door of the store. Maybe even more over time. I have a policy of taking back any vintage guitar I sell for full value if you decide to trade up within a year but even without this kind of assurance, you aren’t likely to lose money any time soon on a vintage 335. Yes, the bottom fell out in 2008 after the bubble burst but if you look at how 335’s have come back since then, you might be reassured that the same thing isn’t imminent. 2008 was a true bubble and even without the Wall Street masters of the universe collectively trashing the economy, the bubble was bound to burst. Interestingly, 335’s didn’t get hit all that hard (nor did bursts). The Jrs and Specials and Strats still haven’t recovered but Teles are doing well and SG’s have recovered a good bit as well. A sane recovery is a good sign that these strong performers might still be a good investment. At the very least, they will likely hold their value in the near term. I’m betting my livelihood on it, so you can take some reassurance from that. 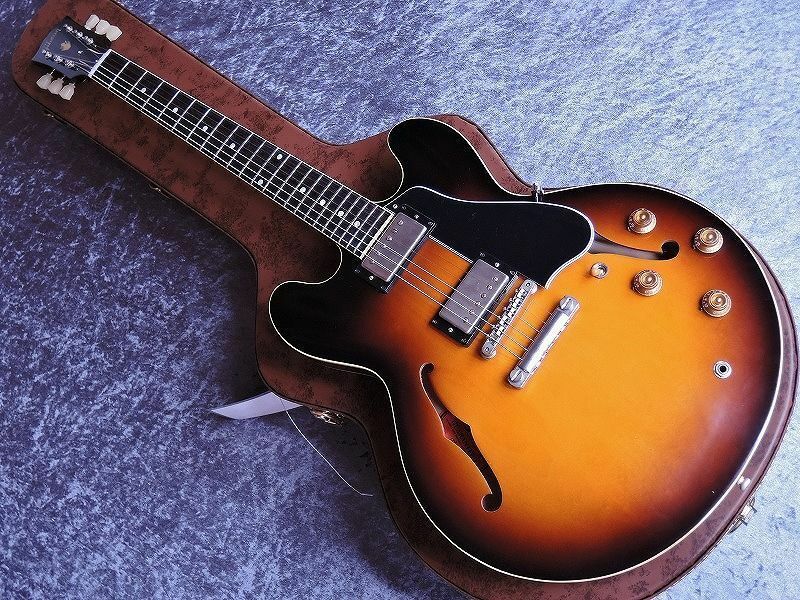 So, given that a new 335 will cost you up to $6199, what are the vintage alternatives? Well, there are loads of them. I’ve found big neck 65’s with some minor issues for around $6500 and if you can handle the smaller nut width, you can get a pretty close to mint 68 for less than that. 68’s don’t get as much respect as they deserve sometimes. The build quality is generally quite good and the neck can be pretty hefty. You just have to be able to deal with the narrow 1 9/16″ nut. And don’t dismiss the narrower nut out of hand. I’ve never liked it but after about a half hour of playing, I barely notice. There is some misinformation out there about the nut width on the 68’s. A well known and much loved vintage guitar site states that: “Neck size increases back to 1 11/16″ with a decently size back shape. ” It doesn’t. The back shape gets pretty big but the nut is still 1 9/16″. There are plenty of other choices in the price range that will make you a happy player. I found a 61 dot neck with a nasty neck break for $6500. It was ugly but it played great. I found a refinished 62 for around the same price (no not that great sounding dot neck 62 that was candy apple red-that was more). There are excellent early to mid 70’s 335’s out there for way less than a new Gibson but-like a new Gibson-make sure you play it before you buy it. The 70’s 335’s can be really awful. They can also be quite good. Still has the narrow nut but so does a $30,000 Stratocaster. The 81-85 335 dot reissues are generally pretty good with some minor mods to improve tone. They’ve always played well, they just need some minor work to sound their best. Read this if you want to know more. Bottom line is that you can get a really great player for less than a new reissue. I knew that day would come eventually but it seems to have come sooner than I expected. So, I’m not saying a $6000+ Gibson ES-335 59 reissue isn’t worth $6000+. I’m just saying that you could spend the same $6000 and get pretty close to what you are trying to emulate with that $6000 reissue. And, to be fair, there are much less expensive new 335’s and I’ve been pretty impressed with some of them (Warren Haynes 61 and Rusty Anderson 59). So, there are further options. When I get a chance to play the $6199 one, I’ll let you know what I think. If the nice folks at Gibson would like to send me one to test drive, I’ll be happy to give my impressions. 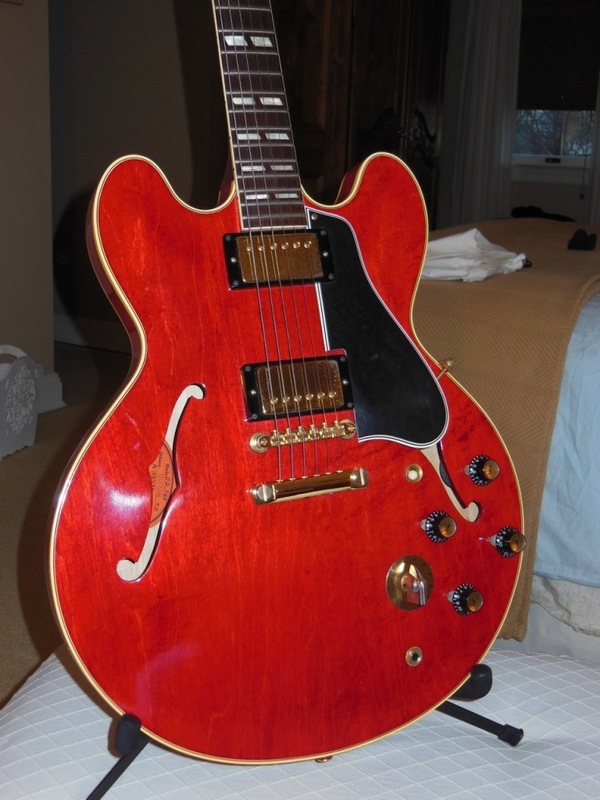 I recently sold this near mint 68 ES-335 for $5500. It had been re-fretted and the binding were a little beat up but otherwise it was really clean. What would I rather have? A new 59 reissue for $6500 or a vintage 68 and $1000 in my pocket. Hmmm. This near mint 59 335 had been re-fretted probably because it originally had small frets. It still was a top dollar guitar. And yes, the nickel is a little tarnished on the neck pickup cover. Take off a buck. There are a lot of things that can be done to a vintage guitar that can trash the collector value. You could start by drilling holes. Holes are the value killer. Schaller holes can knock as much as $10,000 of the value of a guitar although $3000-$4000 is more typical. Bigsby holes are even worse. Coil tap holes are worth thousands each even if they are well filled. I don’t make the rules but, in general, anything that is permanent is big trouble. But there are some exceptions. Bear in mind that these are my opinions-I don’t make the rules but I have to come up with values for all the guitars I buy and sell and I’m still in business so I must be doing something right. The title is my usual response when somebody complains that there is something wrong with a guitar that just doesn’t make much difference. Let’s say I have a near mint 335 from 59 that has had a saddle or two changed. Take off a buck. The sad reality is that any guitar with a no wire bridge is almost certain to lose a saddle or two over 50 plus years. And the fact that original saddles aren’t that hard to find makes it into a kind of non issue. I’m sure you don’t expect original strings after 50 years, so lower those expectations a little and be aware of the stuff that happens over multiple decades. For example, tuner tips shrivel up and fall off. If I’m selling any 59 with Klusons, it’s bound to need a set of repro tips. It’s nice to get an original unshrunken set but it’s not likely and the value isn’t going to be affected very much because everybody expects it. And therein lies the key to the “take off a buck” issues. If everybody expects certain aspects of an instrument to change over time, then it’s really not that much of an issue. Checking in the finish is like that. The likelihood that a 50 plus year old guitar is going to have no finish checking at all is pretty slim. An unchecked guitar might command a premium but a checked guitar doesn’t generally get it’s value lowered just because of checking. Again, everybody expects it. Re-frets are not quite in the same league but I think that any guitar that’s been played can be expected to have a re-fret and I don’t think it does much to the value as long as its done well. Again, a mint guitar with a re-fret might raise an eyebrow but the truth is that many of these guitars are incredibly well cared for even if they are played every day for 50 years. Especially one owner guitars owned by non professionals. Original solder. This became a big deal when vintage guitars started getting really pricey. I think it was meant to be more of an indicator that your pickups hadn’t been messed with but it turned into a thing. I get asked it all the time-“are the solder joints all original?” The answer is usually yes on ES models because nobody likes to mess with the harnesses on the early ones but sometimes you just can’t tell. I’ve resoldered a bad joint using the original solder and if I’m careful, I don’t think you could tell. What I think is really going on is that buyers want some assurance that the pickups have never been out of the guitar and that they have never been re-wound. I get that and it’s important. But if the ground wire got knocked off and somebody resoldered it? Take off a buck. Finally, worn hardware. Especially on gold hardware guitars like 345’s and 355’s. And tarnish on the nickel ones. There is so little gold on those tailpieces and pickup covers that most of them were worn by year two. Don’t expect to find perfect gold plating on a vintage guitar. I’ve seen some but it usually means that either the guitar wasn’t played which can present its own set of problems or it means they were replated. A little wear on the gold is pretty much inevitable and I don’t deduct much value although I might add some value in the rare instance that the gold is perfect. I wouldn’t know because I’ve never seen it. This 60 345 is as close to mint as it gets and there is still some wear on the pickups covers. Not much but feel free to knock off a buck-aaah what the heck, take off a buck for each one. Big neck 65’s are always a good deal. Even better as Gibson keeps raising their prices. I’ve had a few that will hold their own against a 58-59 dot neck. It has always surprised me you can pay $40,000 for a great old vintage 59 335 that plays great, sounds great and will probably hold its value for some time and, at the same time, you can pay under $10,000 for an early 65 that will hold its own in playability and in tone. And really, what’s the big difference? Mostly the tailpiece. The other changes are actually pretty minimal. The construction of a 59 is a little different-the neck set is shallower and the body is a bit thinner. Do these changes make a difference? Maybe but not a significant difference. There are some who feel the shallower neck angle makes for better tone but the shallowest neck angle is a 58 and, while they are held in high regard, they don’t reach often the lofty prices of a 59. The thinner body is only marginally thinner and most folks don’t even notice it. Then theres the cutout under the bridge pickup that was supposed to make it easier to install the harness (which it does by a lot). Does that change the tone appreciably? It seems to change the acoustic properties slightly but it really doesn’t change much once its plugged in-at least not to my ears. It does knock off an ounce or two of weight if that’s any consolation. Don’t get me wrong, I love a 59 and I understand the great desire of most collectors to have one but if playing (and having some money in the bank to pay your mortgage) is more important than having the one everybody wants (complete with bragging rights), then an early 65 is a great deal. With Memphis 335’s rising in price north of $6000 (sticker price, anyway), the 65 starts looking like a smarter buy. The pickups in an early 65 (nickel covers) will be the same as PAF’s. later 65’s usually have the poly coated windings which are still good pickups. There’s another guitar out there that should cost more than it does. Consider the early Epiphone Sheratons. The construction of the early ones is identical to a 355 and the electronics are always mono. Mono 355’s are not cheap. early Sheratons generally are. They are rare, for sure but I don’t think you could pay more than $12,000 for one unless it’s a blonde. I’ve had at least 4 or 5 early ones in sunburst-all in the $10K-$12K range with one of the best necks ever carved (big vee). The later ones with the mini hum buckers can be had for even less. The nut stayed wide well into 65 and some 66’s have at least 1 5/8″ nuts. The profile gets very thin-like the 355’s but the playability and tone are usually excellent. The Sheraton was a very expensive guitar in its day and was not very popular probably because of the price. There were only a few hundred made per year. That brings me to the blonde ones. Recently, I acquired a 1964 Sheraton in factory blonde (only 400 numbers from Claptons 335!!!). 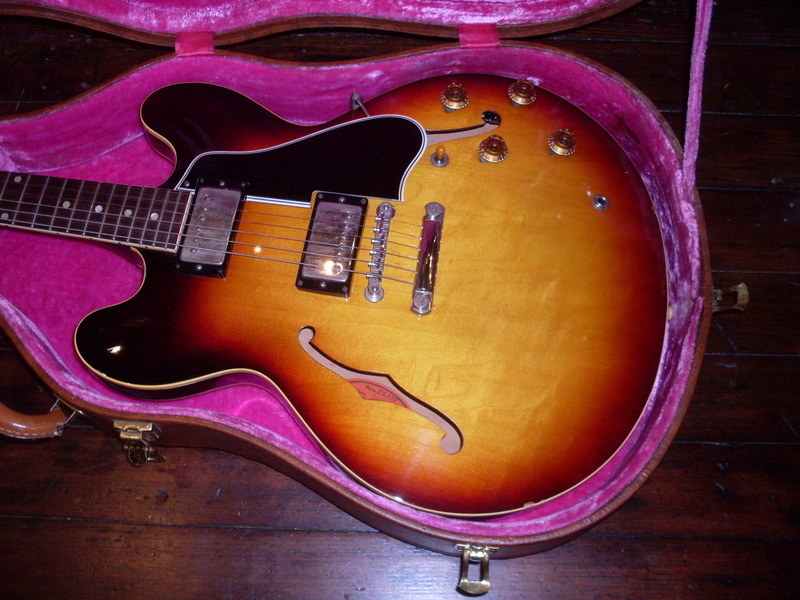 Imagine a blonde 64 mono ES-355. That would probably be a $25000 guitar or close to it if it existed. They made 18 Sheratons in blonde in 64. That makes it rare. It has one PAF and one patent number mini hum bucker. The tone is quite wonderful-like a PAF with more mid and a little less bottom. The neck is a lot like a 61-62 ES-355-wide and thin. Why is this guitar so undervalued by collectors? Mini hums? Long, sort of ugly headstock? Fancy inlays? I dunno but it’s a deal. Great deals don’t stay great deals forever. 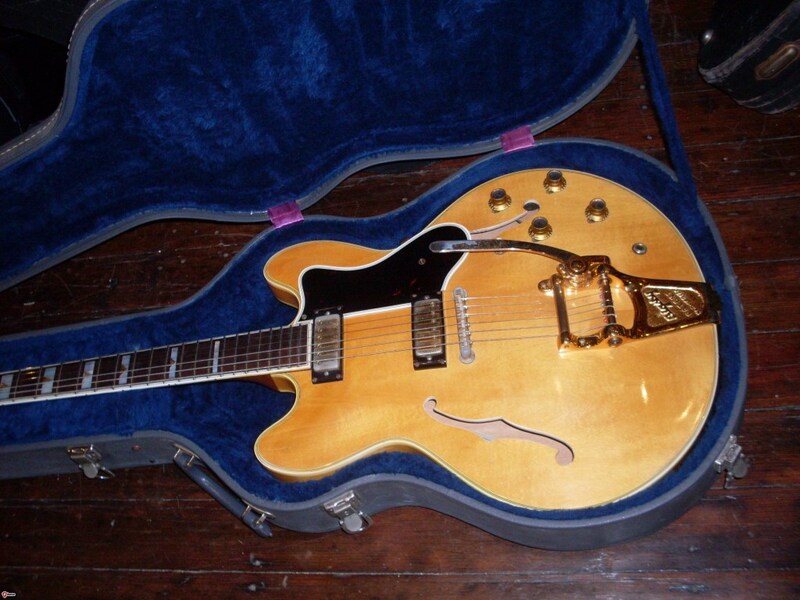 There was a time not long ago that a 68 gold top was a cheap compromise for the buyers who wanted a 50’s gold top. Now a 68 is a big collector guitar and the early 69’s are getting up there as well. The larger point is to judge a guitar on its merits, not on its price or the demand for it. Granted, the demand often has a lot to do with the quality but there are definitely quality guitars out there, at reasonable prices, that low demand has kept affordable. Play one and see for yourself. Why don’t these cost more? A 64 355 mono is a $12000 guitar in red. A blonde would be twice that if you could find one (none officially exist). 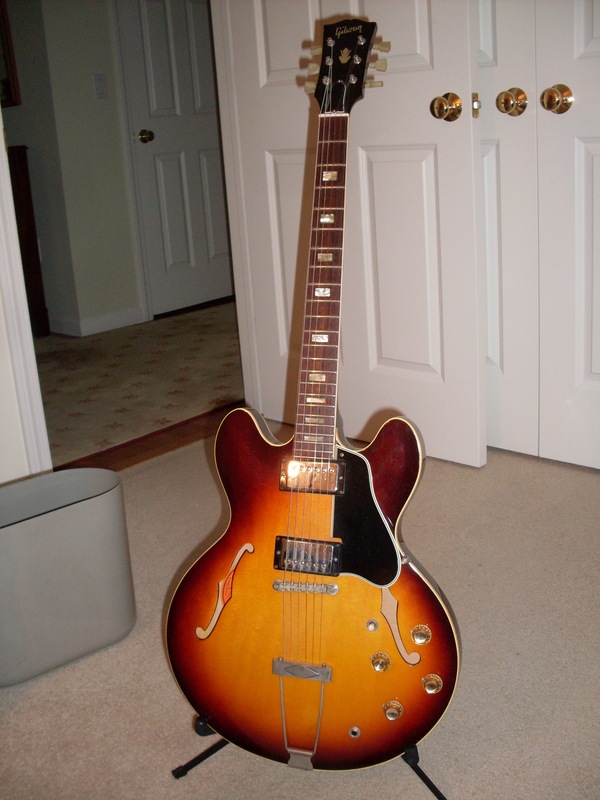 Sheratons are perhaps the best deal out there for a semi hollow 60’s guitar. Rivieras can be a deal too but they are not easy to find with a wide nut.